5 Reasons Why Your Financial Outlook Just Got Better Even if a big raise is not imminent for you, five factors are helping stretch today's paycheck: cheap gasoline; a strong dollar; low interest rates; fierce retail competition and a huge corn harvest. Gas prices below $3 per gallon add up to big savings for consumers. Chances are good you won't see much more there than you did in the summer of 2008 — just before the financial crisis hit. Average private-sector earnings are $24.53 an hour now, unchanged from 2008, after adjusting for inflation. So most likely, you haven't felt yourself moving up for years. On Friday, the Labor Department said that its latest wage-and-salary index reading showed a 2.3 percent rise over the 12 months ended in September. And the Commerce Department's monthly measure of personal income also ticked up slightly. "Even a minimal increase in wage growth is a sign of welcome improvement in the labor market," Lindsey Piegza, chief economist for Sterne Agee, wrote in her analysis. Many economists say bigger raises may be coming soon. "We expect this trend of rising wages will continue and provide the fuel for an economic expansion that could last several more years," Bernard Baumohl, chief economist for The Economic Outlooks Group, wrote in his assessment. Cheap gasoline. In the summer of 2008, gas was $4 a gallon. On Friday, AAA said the national average, as of Saturday, will be below $3 for the first time in four years. The auto club says that downshift will save consumers $250 million a day, compared with earlier this summer when gas was $3.68. Cheaper food (eventually). Corn harvests were enormous this year, sending prices much lower. In 2008, a bushel cost around $8; now it's about half that. It takes a long while for low commodity prices to work their way through the food chain, but the huge corn harvest should help cut animal feed prices, which eventually could tone down the high beef prices that have hurt shoppers. Of those five factors, perhaps none lifts consumers' spirits more than those tumbling gas prices. "Consumers are experiencing 'sticker delight' as gas prices unexpectedly drop below $3 in much of the country," AAA Chief Executive Bob Darbelnet said. 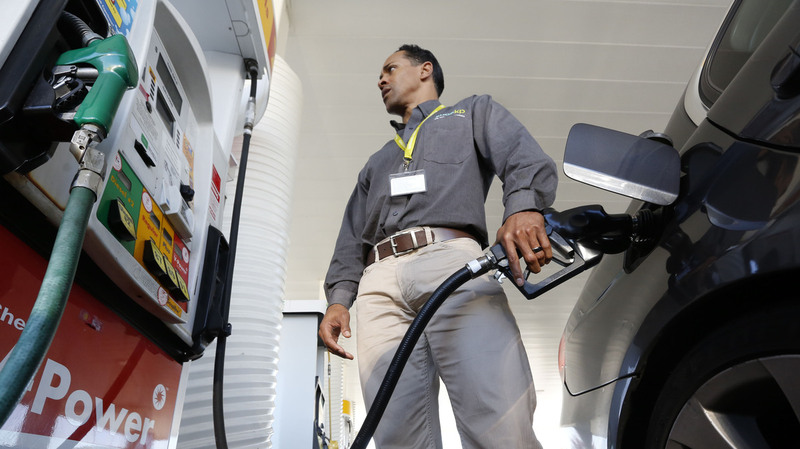 "Lower gas prices are a boon to the economy — just in time for holiday travel and shopping." Jose Ferreira, a real estate developer filling his tank at a Boston gas station, did indeed express delight with the price decline. "People struggle to survive, you know. If you can save some money, it's great for everybody," he said. And while cheap gas can brighten your near-term financial situation, the stock market's surge can help with the long term. On Friday, the Dow Jones industrial average closed at 17,390, up 195, to hit a record high. On the same date six years ago during the financial crisis, it was at 9,325.